Did I mention I love British Chick Lit? So mix it with a Young Adult novel, and bingo! Perfection. Here’s a great book to read on Valentine’s Day. ‘Cause though being in love is great, you also need to love yourself! The Low Down: My name is Harriet Manners, and I am a geek. So starts this tale of a girl who loves being a geek. What she doesn’t love is that others think being a geek is something horrible. Harriet and her best (and only) friend, Nat, have been BFFs ever since they met hiding beneath a piano. Harriet had already had enough of kindergarten (well, specifically, Alexa) and Nat’s dad had run off with a grocery store check-out girl. They bonded immediately. Nat cons Harriet into going on a school trip with her to The Clothes Show Live. Which, to Harriet, is basically shopping with school permission. But when Harriet finds out the real reason why Nat is so keen on going, like a best friend, she is supportive and…wait – left behind? Nat wants to be a model. That’s all she’s ever talked about. And today it is her chance to meet people in the business. So when she sees an agent and takes off, is it Harriet’s fault that she’s the one discovered by Infinity Models? Then she sees Nat. Staring right at her. Busted. And Harriet does her go-to move. She hides. Ducking under the table, she soon realizes that she’s not alone. And he’s gorgeous. This is a story about liking yourself, being yourself, yet not being afraid of moving ahead. About being honest not only with your family and friends (and stalker), but with yourself. And how to let go of the baggage without losing yourself. Oh, and fashion. There’s a bit of that, too. Best Thang ‘Bout It: It is one of those books that you like and just whip right through. The characters all seem real, especially the goofy dad and the stepmom who doesn’t seem to put much stock in modeling as a career. Love Wilbur, the agent from Infinity Models and Toby, Harriet’s stalker. Their talk about feeling like polar bears in the rainforest is sweet. I love the humor and can see a family resemblance to the books by Ally Carter. Funny and clever with a large helping of smart. I’m Cranky Because: It is one of those books that you like and just whip right through. I am hoping there will be another one, since Nick needs to be in more than he was in this this one. Seriously. And please? If there is a next one, please don’t make it about how Harriet and Nick are on separate jobs a lot and don’t get to see each other and Harriet gets jealous of the other models. Please? The Bottom Line: It’s a fun book that I can easily see being made into a movie or series on Nick or Disney. It’s sweet and triumphant, too. Celebrate your inner (or outer) geek! 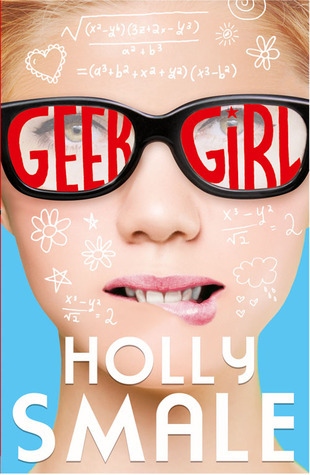 Geek Girl by Holly Smale will be published February 28, 2013 by HarperCollins. A free copy of this book was given to Ink and Page in return for an honest review. Big thanks to NetGalley, HarperCollins and Ms. Smale. Yay! Yes, you should add it. It’s cute! Okay, Geek Girl looks like so much fun. I’ve really been into contemporary books lately. Thanks for the review. I think you’d like it. It’s one of those that you gobble up!